The 1st and core work area is ordered to Samsung C & T: The outer blocks of the south breakwater, west breakwater, and dock for aircraft carrier and cruise. 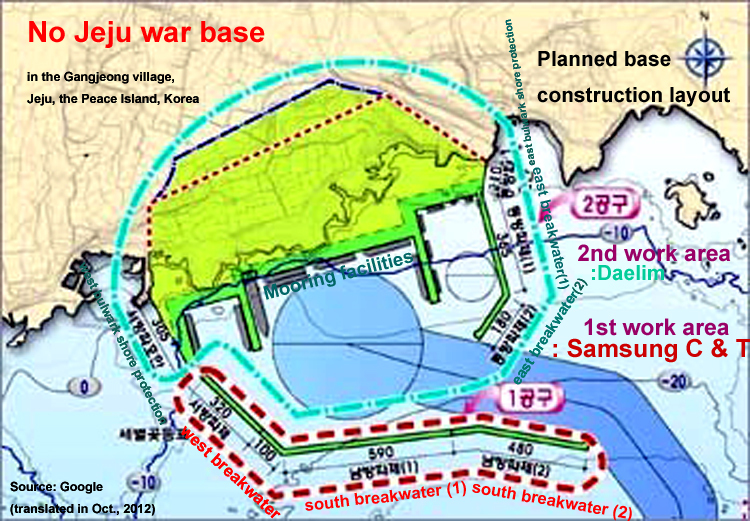 The 2nd work area is ordered to Daelim: East breakwater, east break water shore protection, mooring facility and west breakwater shore protection. The Ministry of National Defense (MND)’s first approval on the defense/ military facility on Jan. 21, 2009 did not need the navy’s submission on the diagnosis report since the revised Maritime Traffic Safety Act became to be effective only from Nov. 28, 2009. HOWEVER, the MND’s alteration approval disposal on March 15, 2010 that even the Supreme Court acknowledged as a separate disposal needed the navy’s submission of the diagnosis report, which was NOT carried out: A violation of law. Also, since the reclamation license permitted on the navy on March 3, 2010 was DONE WITHOUT the submission of diagnosis report, it is unlawful, as well. Those exposures are very important since the Supreme Court has made a court decision that the Jeju naval base project is LEGAL on July 5, 2012. See here. On Oct. 22, the villagers developed the issue again with the below translated statement. The village Association attached the two proof documents not translated here but useful. You can see those two PDF files at the bottom of here. The villagers demanded the Island governor’s reply to their inquiries by Nov. 7. Through the material resources collected upon the National Assembly inspection on the government offices, it has become clear that the Jeju naval base project has so many procedural violations of laws. On the first inspection, regarding the matter on the non-enforcement on the maritime traffic safety diagnosis following the Maritime Traffic Safety ACT (Enforcement Date 27, May, 2009), claimed [on Oct. 18], it reads in the maritime traffic safety diagnosis guidebook supplementary provisions that [only] research reports ‘on the projects whose research service works have been finished before Jan. 26, 2010,’ should be switched to ‘diagnosis document.’ [Please notice] the investigation and test report on the Jeju naval base project 1st work area (Samsung C & T) was issued in April, 2010. In other words, the Ministry of Land, Transportation and Maritime Affairs (MLMT) did not demand the Chief of Naval Operations on the submission of diagnosis report even though it is clear that it is the project subject to maritime traffic safety diagnosis. Also, the Navy Headquarter got the reclamation license on the public water and its vicinity surface from the Busan Regional Maritime Port Affairs and Port Office, without submission of diagnosis report on the date of March 3rd, 2010. It is an act that the Office permitted the reclamation license for the law-violating project, which is also unlawful. Further, the Navy Headquarter applied for the approval on the reclamation execution plan on the public water and its vicinity surface on the date of March 5, 2010. Even though it was supposed that it should submit the construction specifications and execution layout books etc., it got approval on the execution plan without submission of specifications on the 1st work area and execution layout books on the date of April 6, 2010. Since the 1st work area (Samsung C & T) construction specifications and execution layout books were issued in May 2010, it could not present those [to the Office]. 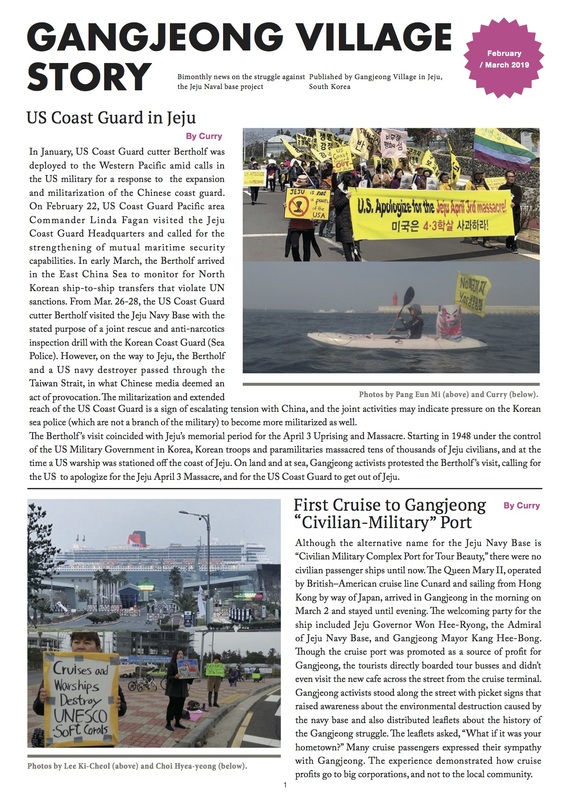 In other words, it turned out that the Jeju naval base project is full of all the procedural violations, related to the matter on the public water and its surface, not to mention the violation of non-execution on the maritime traffic safety diagnosis following the Maritime Traffic Safety Act. Therefore, Woo Keun-Min, the Jeju Special-Self governing Island governor, who has all the authority on the reclamation license on the public water and its vicinity surface should be responsible for all the recovery of flaws and immediately cancel the approval on the execution on reclamation. As the Island governor Woo Keun-Min claims fair simulation, what he should do is to demand the navy maritime safety diagnosis, according to law. It is needless to say that verification process could be objectively and fairly done ONLY when the construction stop precedes it through cancellation of reclamation license. As clear proofs that there have been administrative procedural flaws in the Jeju naval base project beyond political arguments, we will proceed a process to strictly inquire on the responsibility on the illegality to the Chief of naval operations and Chief of Busan Regional Maritime Port Affairs and Port Office.